How Do Cops Cool Off in the Summer Heat? Why, It’s Easy Peasy, Lemon Squeezy with the Help of Little Theresa Ann and Her Lemonade Stand! 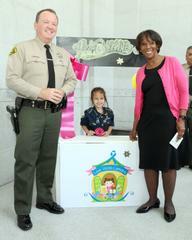 Los Angeles County Sheriff’s Department Sheriff Jim McDonnell and Los Angeles County District Attorney Jackie Lacey visited with Love with Lemons hostess Theresa Ann Babcock, when she stopped by the Hall of Justice as part of her “Supporting Law Enforcement” Summer Tour. 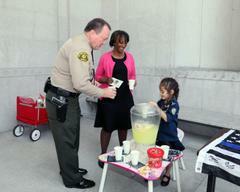 Theresa Ann’s quest to show her love and appreciation began with a little girl’s desire to set up a lemonade stand. 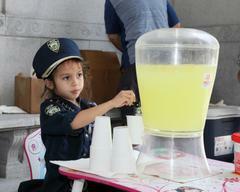 In 2016, after three Baton Rouge police officers were shot, Theresa Ann, with the help of her parents Robert and Grace Babcock, decided to take her lemonade stand across the nation to help support the families of fallen officers. 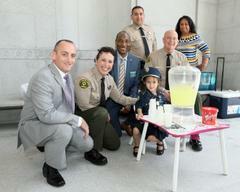 For the last two years, five-year-old Theresa Ann has been visiting various law enforcement agencies throughout the country with her lemonade stand, showing her appreciation, love and willingness to help others, one cup at a time. 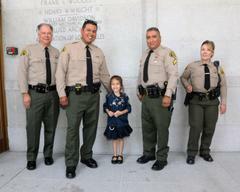 To date, this precious and kind little girl has raised over $2,800 in donations and devoted profits to families of fallen law enforcement officers and other causes. 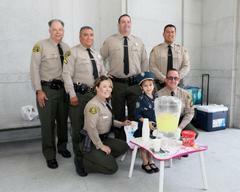 After learning Theresa Ann was coming to Los Angeles host her lemonade stand and as a token of appreciation for the liquid refreshment, members of the Los Angeles County Sheriff’s Department, spear-headed by San Dimas Station Deputy Jason Rodriguez, decided to build her the official “Love with Lemons” lemonade stand. Theresa Ann has shown a great deal of fortitude in furthering her foundation to her near and far communities. “She (Theresa Ann) is just trying to do the right thing. 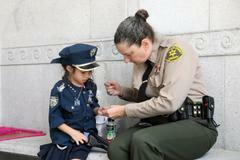 Sometimes children remind us to always to do right by others”, said Deputy Jason Rodriguez. Text and email, register for LASD Nixle messages: To receive more detailed, up-to-date information via E-MAIL and/or TEXT directly from the Los Angeles County Sheriff’s Department (LASD), sign up for "Nixle" alerts at http://www.Nixle.com and register for "LASD – Los Angeles County Sheriff’s Dept Information Bureau (SIB)" AND your local LASD station area. To receive URGENT TEXT ALERTS ONLY, text your zip code to 888777. Standard text messaging rates may apply depending on your calling plan. 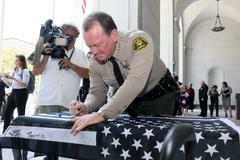 L.A. Crime Stoppers: Partner to prevent or report crime by contacting your local Sheriff’s station. 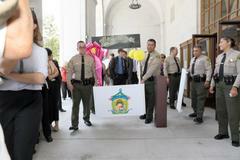 If you prefer to remain anonymous, you may call “L.A. Crime Stoppers” at 800-222-TIPS (8477), use your smartphone by downloading the “P3 MOBILE APP” on Google play or the App Store, or use the website http://lacrimestoppers.org.